Grind all the masalas (ginger, garlic, coriander, turmeric, chili, pepper, masala) with required amount of water. Marinate chicken with this ground paste, salt and curd. In a pan, add ¼ cup of oil. Cook chicken in it till the water reduces completely. In another pan, add oil. 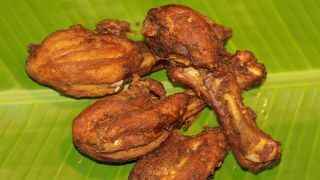 Fry chicken pieces till it turns brownish red. It should be crispy. Fry curry leaves and onions in the same oil and garnish the fried chicken pieces.